The Christmas season is the perfect time for a holiday beach party! Especially if you live in an area where the weather will be favorable. This Christmas season, my friends and I are heading to my sister’s Florida beach condo for our annual party. Though the trip will span a weekend, we are dedicating an evening of our trip to everything Christmas-fun! Her beach condo was the absolute perfect place for a holiday beach party and I couldn’t resist offering to be a host. Of course, that meant I had to come up with all of the party ideas! 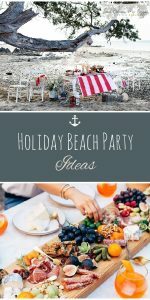 It was a little stressful at first, but I scoured Pinterest and the internet for all of the best holiday beach party ideas. 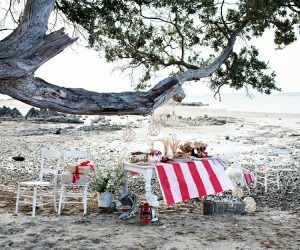 From tablescapes to desserts, you’ll find everything you need to throw a holiday beach party here! 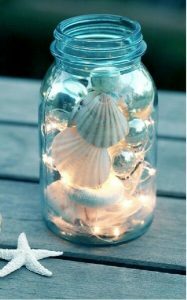 For a simple decoration, fill blue-tinted mason jars with a string of fairy lights, ornaments, and a few seashells. If you want, you can learn how to dye your mason jars blue with this tutorial of mine! 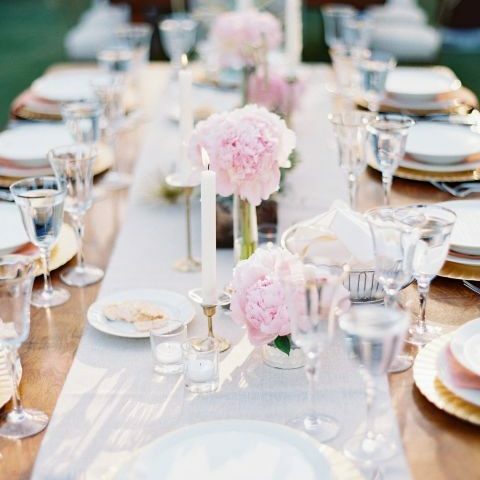 Use these as centerpieces that you can give away as party favors! Cover the jar with a piece of burlap and a large white ribbon. A good tablescape is my favorite part of any party, so I knew I had to go all out for our Christmas beach party! I loved the rustic appeal of this tablescape and the gorgeous whitewashed furniture. There are even galvanized metal planters full of beach friendly Christmas greens scattered throughout to make things feel really season. Complete things with a wide, striped table runner and a craft-paper wrapped gift at every place setting. Image from Homes To Love. 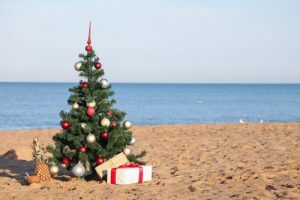 I’m not against bringing a real Christmas tree to our holiday beach party! I think it only adds to the charm. However, I think that I would swap the shiny ornaments for ones covered in a soft burlap, instead! I think soft hues work best on the beach and I think these ornaments from Amazon would be perfect! There’s something about a dirty-iced cake that just reminds me of the beach. Top things off with candied rasberries and an herbal sprig. 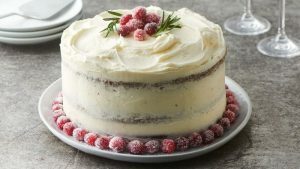 Not only does this cake look perfect for a holiday beach party, it’s also more of a lighter dessert for those who don’t want something too heavy. Plus, I think that it photographs beautifully! Party-planners looking for a delicious dessert for a beach Christmas party can find the recipe at Betty Crocker. **For a non-alcoholic version, substitute ginger ale for the wine! Squeeze an orange over ice and thoroughly mix in the ginger beer and Aperol. Pour in the Processco, garnish with an orange and serve. You could even add in a few cranberries for more of a holiday twist. Image from Princeslessly.